If there is a favorite breakfast for me after puttu,it has got to be shevai.I got introduced to this delicious breakfast after marriage.At my place,we make idiyappam which is almost similar to this,but the procedures and taste differ a lot.I fell in love with it the moment I had it first.The best part about this shevai is,it can be had with any curry or just plain..drizzle a drop of coconut oil,mix and eat,as simple as that! !Even though the process might appear difficult,when you devour it after all the hard work you feel it was all worth it!! Whenever we go to my in-laws place,amma makes sure she makes it for breakfast the day we reach.In fact my father-in-law teases me saying that if there's shevai on the table I don't need anything else coz I'll eat it for lunch and dinner as well;-).I had not ventured into making this,of course mainly coz of the hard work involved,but also due to the fact that I feared that if I made it and it flopped..well! !Last year,when we had gone to Mangalore to attend a cousin's wedding,we got a shevai danthe(the shevai press).I have been a part of shevai making process with amma,so I had a vague idea as to how to go about it.I feared asking her for instructions coz if it flopped,she would feel bad and so would I.
I made the batter,made the shevai dough,steamed it and it was ready to be put into the press.Hubby willingly pressed the danthe for me while I collected the shevai from beneath.When he pressed it,my heart was literally in my mouth..! !When I saw perfectly looking shevai coming out of it..I almost jumped with joy..! !Hubby was wondering how these things could make me so happy..if only he understood! !I have been making shevai proudly ever since,but if given a choice,me and hubby would definitely prefer amma's shevai.I think she makes the best shevai I have ever eaten..love you ma,for all the hard work,just for whetting our palettes..!! Soak the rice for 4-5 hours. Grind with grated coconut to a smooth paste,add enough water. In a thick bottomed kadai add the oil and twist a little so that the oil is spread all over. Pour the batter and keep stirring till the batter resembles a paste,stiff enough to be shaped into balls(this method is called alavche,in Konkani). When the dough becomes a little cool to touch,shape balls in oval shape. In a steamer or an idli cooker(called pedavan),steam the balls for 30-45 minutes till well cooked. Collect the shevai in a plate layered with a wet muslin cloth,transfer to a container once its cold. Serve with vaagu/batata song or have it plain with coconut oil and a drop of pickle!! I am sending this to RCI-Konkani hosted by Deepa of Recipes N More!! 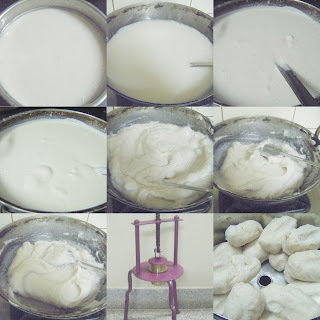 looks delicious..my mom used to make it..here I dont have the maker..planning to buy a small idiappam press ..
Wow! This is really an awesome description of rice sevai. Thanks a lot for sharing it with us. That's a breakfast I know I'd enjoy. Hi Divya! Like you I too love Shevai. But had never attempted to make it because of the hrd work involved and also because I was always frightened they would be difficult to make.Them one day my neighbour called me for Haldi -KumKum.She served Shevai. She is from Andhra.She told me that after grinding boiled rice she steams them in an idli steamer just like idlis and then the idlis are squeezed in the Shevai dante.I immediately tried the method.It made the procedure of making Shevai easy and short.Now recently I found out the same method on the blog Foodomania.Please check it out.Hope you try this out and enjoy the shevai. Keep posting such traditional recipes!! Bread Pizza - Instant gratification!! !